Thomas Miles Hawker was born in Holme-next-the-Sea in Norfolk on 22 March 1897, the son of Thomas Hawker, a police constable, and Minnie Edith née Wales (who also hailed from the same coastal village). From July 1905 to April 1911 Thomas attended Enfield Road School in Hackney, leaving just after his twelfth birthday. No records of his war service have been traced, but he is commemorated on the plaque in Frampton Village Hall. 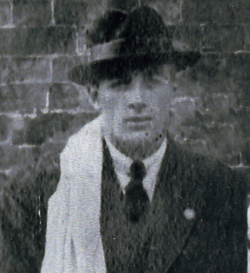 After a brief spell in the village c.1920, when he lived with his parents at Brooklyn, The Street, Thomas moved to Cheltenham and worked as a police constable at the Central Police Station. On 3 April 1926 he married the widowed Elsie Hannah Burnham (née Skidmore) at St Luke's church, Cheltenham. He later returned to Frampton and lived at Ashleigh House, The Street. Thomas Miles Hawker died in 1962, his death being registered in Gloucester Rural District which included Frampton.